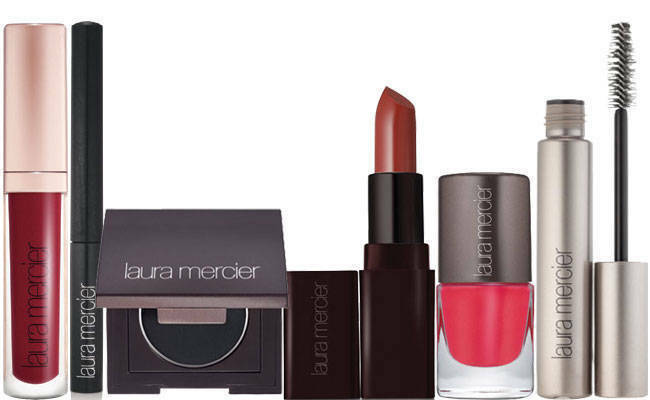 Laura Mercier’s inspiration for 2012 draws from her background as a fine art painter and focuses on the mood and attitude of women through different art periods. The holiday collection, available in November 2012, was inspired by the decorative architecture, style, and mood of the Art Deco period in Paris in the mid-1920s, most notably the beautiful paintings of the artist Tamara de Lempicka. Golds and bronzes are paired with high-shine reds and deep blacks to make this eye-catching colour collection stand out. Eyes are sharply designed and defined—lined in black, with gilded shimmering eye colours as a beautiful golden background. Lips wear super-shiny red lacquer—boldly painted on to make a stunning statement. The face is contoured and sculpted; a true work of art. Nails are painted in rich shades of red and noir. Laura Mercier Illuminating Eye Colour has a multi-dimensional, luminous pearl finish with a soft, bouncy texture for excellent colour pay-off and a smooth, even application. Laura Mercier Lip Lacquer provides high coverage colour with a glossy high-shine lacquered finish. Laura Mercier Creme Smooth Lip Colour is a luxurious new lipstick that gives lips the ultimate in colour, texture, and finish. In one smoothing swipe, the crème formula envelops lips in rich colour with a semi-lustrous finish. The cushiony, lightweight texture feels comfortable, while pure Olive Oil and Vitamin E nourish lips. It features an elegant, modern case with a metalized finish. Open your eyes to Laura’s luxurious new mascara—created specifically to give eyes the look of false lashes. As a renowned makeup artist, Laura really knows the dramatic impact of false lashes. With that in mind, she created her latest mascara to give real lashes extreme volume and length for intense exaggeration and drama. The formula is extra-smooth and glossy, created with a blend of waxes and absolutely no fibers. Build rich, exaggerated lashes that are extraordinarily thick, super-shiny and conditioned. Launch the gallery below for a preview of the new collection!